This article is a short summary of Mario's Cement Factory. Mario's Cement Factory is a game in the Game & Watch series. 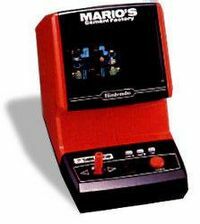 Two versions of the game were produced: one for the Tabletop series (CM-72), released in April 1983, and one for the New Wide Screen series (ML-102), released in June 1983. Move Mario to different levels of the factory by riding elevators, dumping loads of cement from mixers into trucks. Conveyor belts carry tubs of cement to the mixers below. Use the elevators to move Mario to different levels of the factory, dumping cement from the top mixers to the mixers below and into the trucks. Earn points for every load of cement you drop from the mixers to the cement truck. Receive mistake icons by letting a mixer overflow with cement, trying to get on an elevator when you are not level with it, or hitting the floor or ceiling while riding an elevator; receive three mistake icons, and it’s game over! Game Boy Gallery Game Boy 1995 An updated version of Mario's Cement Factory is included in this game. Game & Watch Gallery 4 Game Boy Advance 2002 A recreation of Mario's Cement Factory is available in this game, as well as a modern version. Notably, the modern variant is set in a cookie factory rather than a cement factory. EU: March 26, 2010 A recreation of the original Gold release of Manhole, released as a digital download on the Nintendo DSi Shop. This page was last edited on 17 August 2016, at 17:47.